Download "PRE-EMPLOYMENT SCREENING AND IMMUNIZATION DOCUMENTATION"
1 Page 185 PRE-EMPLOYMENT SCREENING AND IMMUNIZATION DOCUMENTATION In order to protect the health of all residents/fellows, employees and patients, and in order to comply with CDC guidelines and immunization requirements mandated by state and federal agencies, all new residents/fellows must undergo pre-immunization/tuberculosis screening performed by Employee Health Services (EHS) staff before beginning training, payroll or benefits. The following are required: 1. History of measles, mumps, rubella immunization AND positive antibody titer**. 2. History of chicken pox or varicella vaccination AND positive antibody titer**. 3. History of Hepatitis B vaccination AND positive Hepatitis B surface antibody titer**. 4. Proof of two PPD skin tests at least 2 weeks apart or Quantiferon TB Gold test within the past 12 months. If there is a history of positive PPD or Quantiferon test in the past, a chest x-ray report less than 1 year old is required. 5. All residents/fellows will be screened for verbal or documented history of Tetanus Diphtheria vaccination and if needed, vaccination will be provided at no cost. 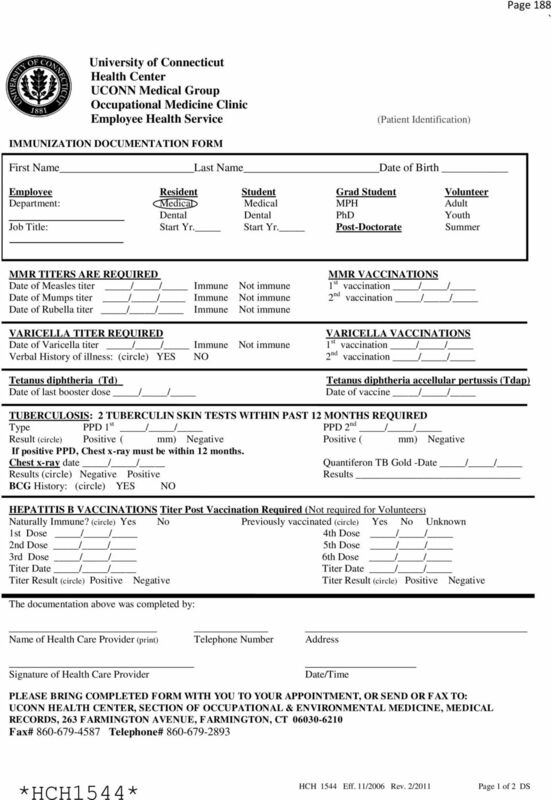 In order to facilitate the screening process: Complete the required immunizations/tb skin tests and have your healthcare provider complete and sign the immunization documentation form. Do not sign the form yourself. 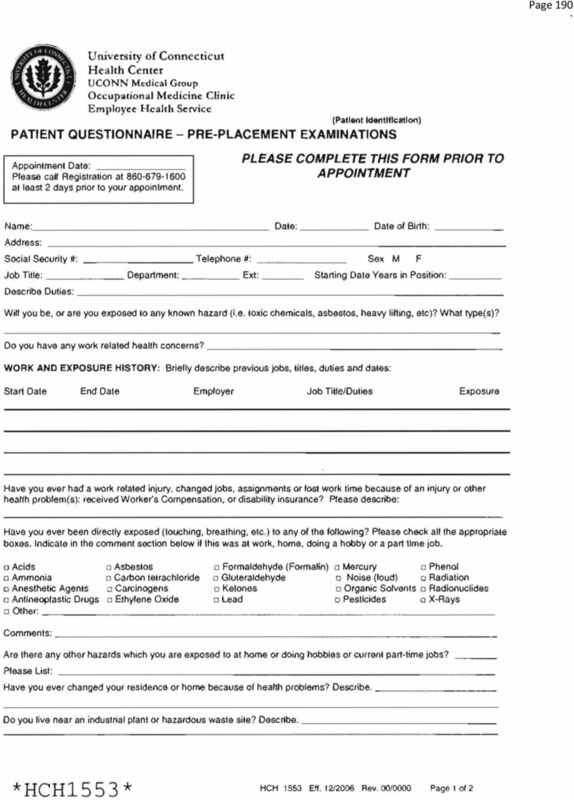 Complete the Patient Questionnaire/Medical History screening form. Bring these documents to your appointment, do not fax or mail them. If you have your vaccination records and/or titers, bring them to your appointment. 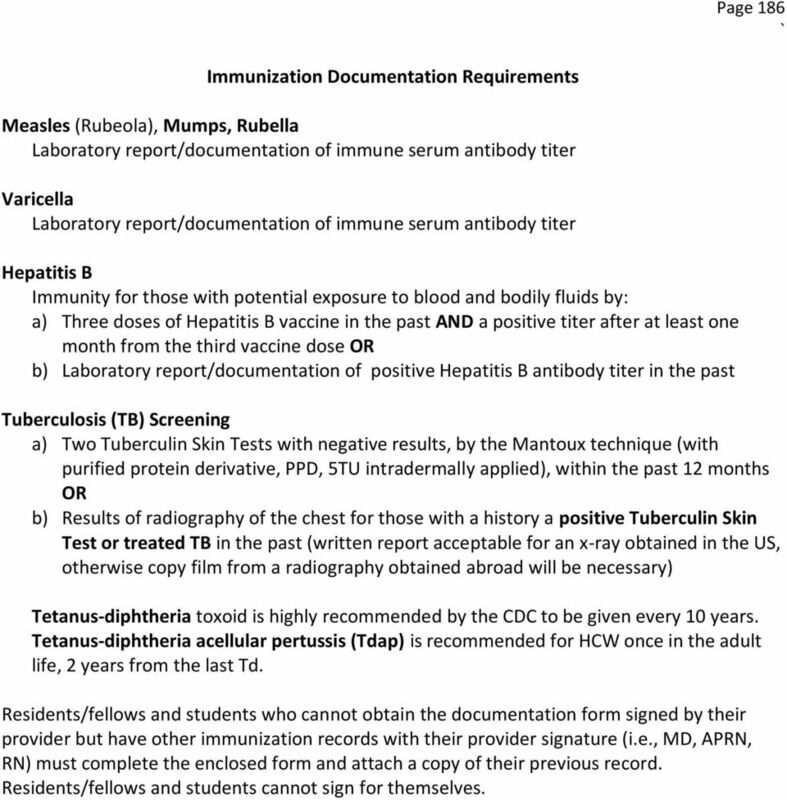 If the immunization/tb test records and antibody titers are not available, we will obtain blood for antibody titers and provide TB skin test/chest x-ray at no charge, but this may delay your clearance. If needed, the required vaccinations will also be provided at no charge. If required, you must return to EHS as scheduled for subsequent PPD skin tests, vaccinations and/or titers, otherwise the Graduate Medical Education (GME) will be notified that you are no longer fit for duty. It is very important that you schedule an appointment early! When you call, it is important that you identify yourself as a resident/fellow. 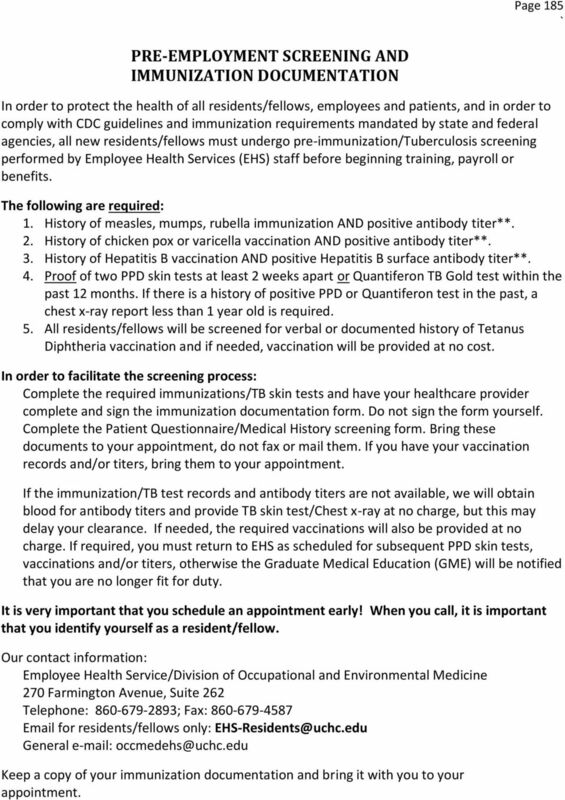 Our contact information: Employee Health Service/Division of Occupational and Environmental Medicine 270 Farmington Avenue, Suite 262 Telephone: ; Fax: for residents/fellows only: General Keep a copy of your immunization documentation and bring it with you to your appointment. 2 Page 186 Immunization Documentation Requirements Measles (Rubeola), Mumps, Rubella Laboratory report/documentation of immune serum antibody titer Varicella Laboratory report/documentation of immune serum antibody titer Hepatitis B Immunity for those with potential exposure to blood and bodily fluids by: a) Three doses of Hepatitis B vaccine in the past AND a positive titer after at least one month from the third vaccine dose OR b) Laboratory report/documentation of positive Hepatitis B antibody titer in the past Tuberculosis (TB) Screening a) Two Tuberculin Skin Tests with negative results, by the Mantoux technique (with purified protein derivative, PPD, 5TU intradermally applied), within the past 12 months OR b) Results of radiography of the chest for those with a history a positive Tuberculin Skin Test or treated TB in the past (written report acceptable for an x-ray obtained in the US, otherwise copy film from a radiography obtained abroad will be necessary) Tetanus-diphtheria toxoid is highly recommended by the CDC to be given every 10 years. Tetanus-diphtheria acellular pertussis (Tdap) is recommended for HCW once in the adult life, 2 years from the last Td. 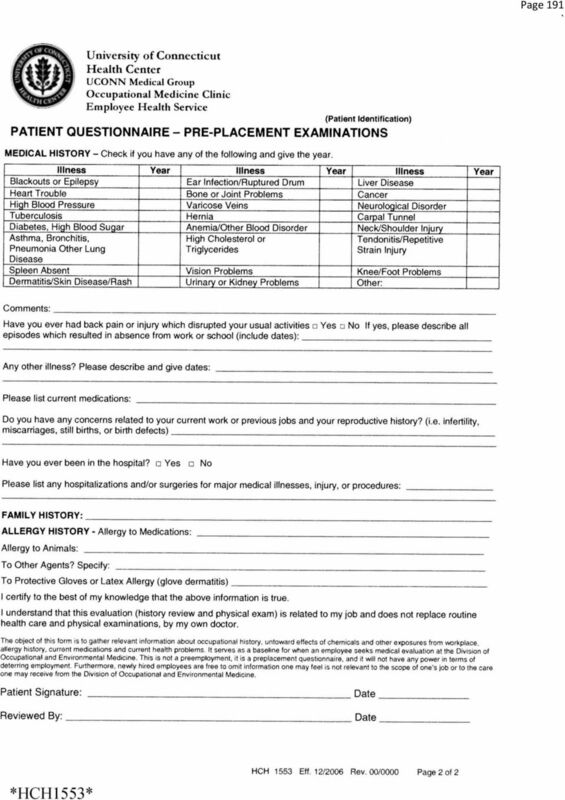 Residents/fellows and students who cannot obtain the documentation form signed by their provider but have other immunization records with their provider signature (i.e., MD, APRN, RN) must complete the enclosed form and attach a copy of their previous record. Residents/fellows and students cannot sign for themselves. 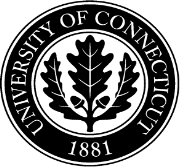 3 Page 187 DIRECTIONS Division of Occupational & Environmental Medicine, UConn Health 270 Farmington Ave, The Exchange, Suite 262, Farmington, CT , (860) From I-84 Take Exit 39 (Farmington Exit). From Northbound Rte. 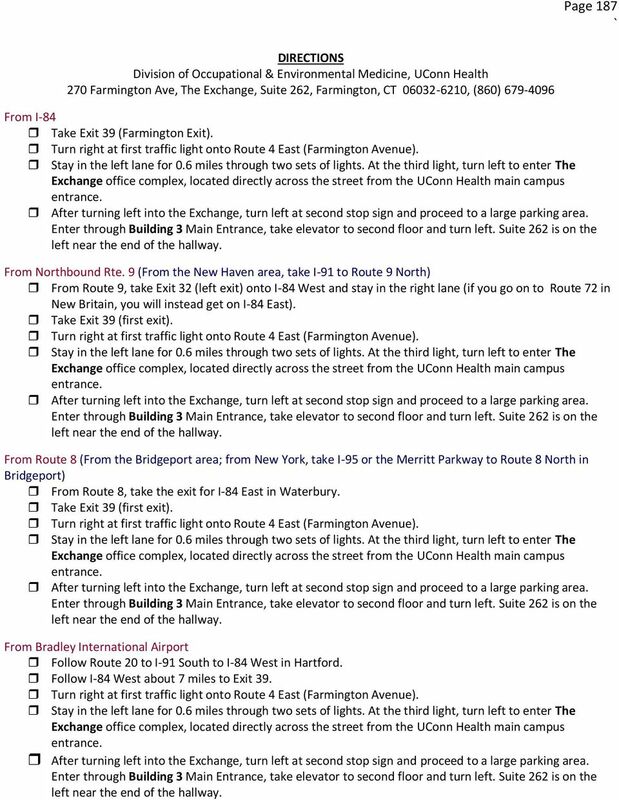 9 (From the New Haven area, take I-91 to Route 9 North) From Route 9, take Exit 32 (left exit) onto I-84 West and stay in the right lane (if you go on to Route 72 in New Britain, you will instead get on I-84 East). Take Exit 39 (first exit). From Route 8 (From the Bridgeport area; from New York, take I-95 or the Merritt Parkway to Route 8 North in Bridgeport) From Route 8, take the exit for I-84 East in Waterbury. Take Exit 39 (first exit). From Bradley International Airport Follow Route 20 to I-91 South to I-84 West in Hartford. Follow I-84 West about 7 miles to Exit 39. Step 1 Obtain required immunizations and/or titers (students must prove immunity by either proof of immunization or titer), AZ DPS Level One Fingerprint Clearance Card, and CPR card for Health Care Providers.